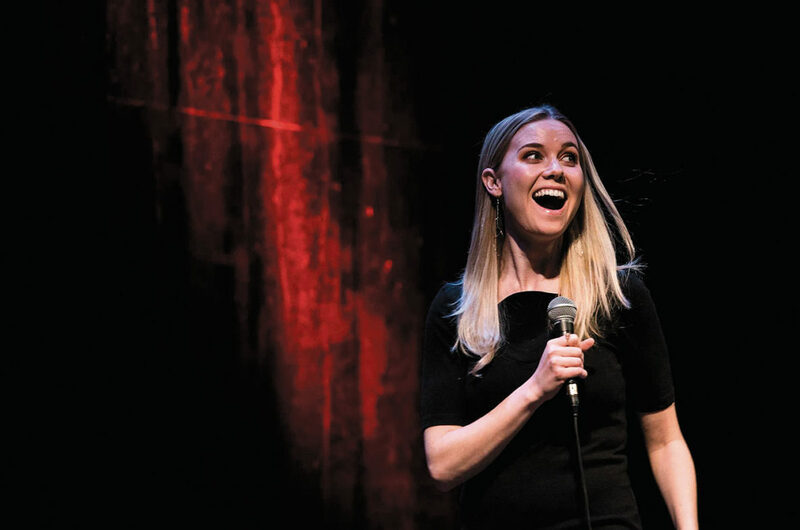 When Kelsey Cook ’11 was a junior in college she delivered her first stand-up performance during an open-mic night at a campus dining hall. “You’re basically intruding on everyone’s dinner,” she recalls. Even if the crowd thought something was funny they had food in their mouth so she couldn’t really hear their reaction. Cook has since made a name for herself in comedy and last spring made her stand-up debut on The Tonight Show and earned her first credit on Comedy Central. She was also back on the road performing stand-up, including a weekend last April at the Spokane Comedy Club where a few more familiar faces were in the crowd—family, friends, and even favorite teachers from her hometown in nearby Cheney. Cook’s comedy career has taken her from New York to Los Angeles to Paris, but when she first arrived at WSU in Pullman, she didn’t exactly have comedy in mind. While taking a public speaking course, a professor mentioned Cook’s assignments were sounding less like speeches and more like stand-up routines. She decided to take an internship in L.A. that summer and meanwhile continued to perform. She returned to Pullman the following semester with a plan to produce a local stand-up show. Cook started Six-Pack Laughs at Stubblefield’s Bar and Grill, which brought in local comedians each week. After graduation, she performed stand-up in the Seattle area for a few years before moving to Los Angeles to perform full-time, along with her boyfriend and fellow comedian Kane Holloway. Cook spent much of the last year touring and preparing for The Tonight Show, which she says has been a huge stepping stone in her career. In one take on the show, she delivered her six-minute set, which included stories about her professional foosball-playing family and latex allergies. “It’s changed my life. Stand-up will always be my first love,” she says, adding that it has helped her get more work as a headliner and that she hopes to turn her credits into even more work. Cook now splits her time between L.A. and New York and has a few tips for the frequent flyer: opt for the TSA Pre-Check, pack moisturizing facemasks, and drink an obscene amount of water. Cook ultimately graduated from WSU with a bachelor’s in broadcast production, but says she still loves math. She likes solving problems and she says she looks at her set kind of like a puzzle, searching for the best and funniest stories that will connect with a crowd.